Once upon a time, Eric and Woody Henderson were inseparable. Adopted brothers. Best friends. Brilliant minds. Years later, they are estranged siblings, petty rivals, and washed-up failures. But when their father’s murder leads them into the throes of a life-altering scientific accident, Eric and Woody will find themselves with a whole new purpose — and a perfectly legitimate reason to wear costumes and fight crime. Co-created, and originally written & drawn, by Christopher Priest and M.D. Bright, this series has now been rebooted by writer James Asmus & artist Tom Fowler, and published by the new Valiant Comics. This is a completely fresh start, so absolutely no knowledge of the previous series is required to enjoy this book. The book opens in the near future, with our heroes in costume (well, Quantum’s in costume, Woody’s just wearing street clothes and sunglasses), either crashing through or being through out of the window of a skyscraper and plummeting to the street below, being saved by some kind of force field that they generated by grabbing each other. This is all caught on film and a TV reporter is speculating if these two new superheroes know what they doing, or are just causing more trouble than they’re worth. Then we flashback to when the two leads, Eric and Woody, are in High School, having been sent to the principle’s office for getting into a fight. Woody had been trying to defend Eric from another kid, but just got them both in trouble, and when their angry father, Derek Henderson, shows up, Eric tries to plead with him that, despite what it looks like “We’re the good guys here,” which is a rather neat foreshadowing to these boys’ future as misunderstood superheroes. Now in the present, we see Derek who is some kind of scientist, trying to gather up some notes and hurry out of his lab, bwhen he’s stopped and killed by some big guy, who works for some mysterious organization. Then we cut to the two leads, now adults, to see where they are in life as they get the news. Eric is in the military, we see him having breakfast at a Diner, and foiling what looks like a robbery, but what was a terrible misunderstanding. So he’s a good-natured man who wants to help others, but screws it up. Woody is an expensive hotel with some woman, but ditches the lady and sneaks out the window when Hotel security arrives, complaining that his credit card was declined, and then he pickpockets a stranger in the park to pay off a debt he owes to a bookie. So he’s still just an overall screw-up. These opening scenes set-up the personalities of the characters very well. They meet again at Derek’s funeral, where we learn that they have not spoken to each other in several years, and actually get into a fistfight and end up getting arrested, but no charges are filed. However, at the police station, they are both questioned by a female detective named Cejudo about their father’s death, as the police suspect that one or both of them may have had something to do with it. Another flashback that Derek took Woody in as a foster child after Eric’s mother died, and he raised them both on his own since then. That night, both Woody and Eric secretly break into their father’s old lab to snoop around for any clues as to why he was killed. They find a hidden USB drive and Eric uploads the files on it while Woody goes looking into a secret room. When Eric goes in to get Woody out of it, he accidentally locks them both in, and then activates the machinery inside. As a bunch of blue energy starts to engulf the room, Eric and Woody fight over the one protective suit available, and then the whole room explodes, taking most of the building with it, and both of them find themselves still alive, but completely naked and glowing with blue energy, while surrounded by Detective Cejudo, who was staking out the building, and a squad of police officers, who tells them they’re under arrest for the murder of their father. TO BE CONTINUED. Excellent first issue, sets up the personalities of the two lead characters, gives us significant info about their background and, best of all, maintains just the right amount of humor without devolving into slapstick or parody. That is, in my opinion, one of the faults of the original series, but Asmus straddles the line to perfection with his writing. And Fowler’s artwork similarly fits the tone of the series. If the creative team can keep up the quality they provide with this first issue, I believe they’ll have a definite hit on their hands. It’s great stuff, and recommended with a Chacebook rating of FIVE STARS. 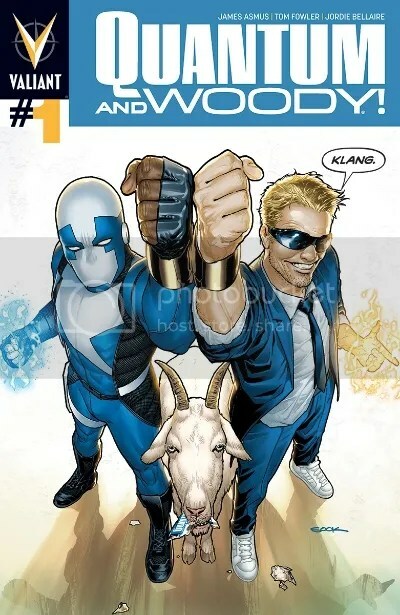 Available in comic-shops or, if you’re not a luddite, just go to Comixology.com and get this NOW.